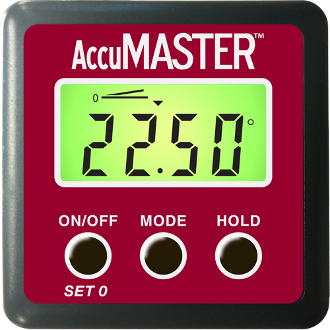 With the AccuMASTER 2-in-1 Digital Level and Angle Gauge you can find true level and precisely check angles on saw blades, jointer fences, sharpening planes, drill press and band saw tables, bevels and many more precision tools. The strong magnetized base lets you attach directly to any metal surface – tables, blades and more. IP54 Certified: protected from dust, water spray. Stayglow™ backlit display stays on as long as you're using it. Set 0 function lets you set any angle to 0° as a reference point. Hold button holds an angle reading in the display.